Remember that dorky Rebellion General Draven in Rogue One: A Star Wars Story? He was always getting in Jyn Erso’s way and telling her to stop her foolish quest to steal the Death Star plans. 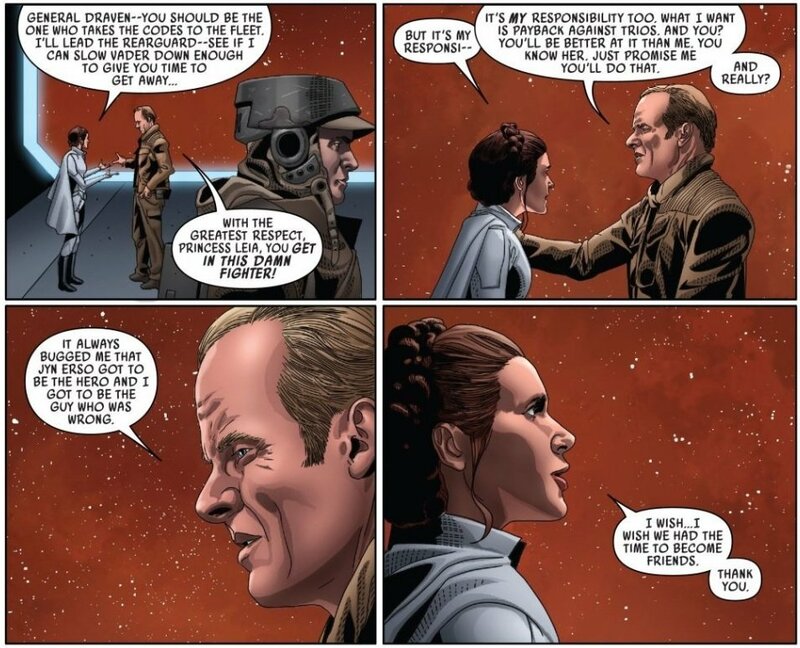 Unlike the vast majority of the cast though, he actually survived the film, but not for long, as his eventual fate has been revealed in a touching sequence in the comic Star Wars #55 by Kieron Gillen and Salvador Larroca. After failing to prevent Erso from retrieving the plans, Draven apparently tried to make up for his obstructionist past by fully devoting himself to the Rebellion and, in particular, to Princess Leia. The current arc of the comics showed a full-on battle between the Rebellion and the Empire, eventually forcing Leia and Draven (and a few other Rebels) onto an Imperial Ship on a secret mission to purloin some codes. Unfortunately for them, though, their escape is halted by the arrival of Darth Vader. Vader pursues them through the ship and though Leia offers to stay to slow him down, Draven demands that he take her place, claiming: “It always bugged me that Jyn Erso got to be the hero I got to be the guy who was wrong.” Draven does indeed slow down the big bad, for as precisely as long as it takes Vader to snap his neck with the Force. Still, even that brief delay allows Leia and the Rebels a chance to escape, so in the end, General Draven was actually a pretty swell dude. I’ve always enjoyed Kieron Gillen’s writing (he’s also made some nice connections to Rogue One: A Star Wars Story before), so it’s nice to see him taking the time to humanize minor cast members from the films and give their stories the finales they deserve.